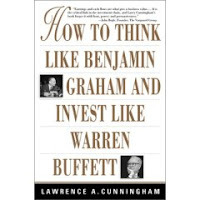 Readers like me would think that this book will outline and guide the reader into thinking about Graham and Buffett’s principles. Although there is some content regarding these two great investors, that is where it ends. Part 1 is a great introduction and a good read regarding the stock market characteristics. He uses the analogy Graham created for the stock market “Mr Market” nicely in describing the ups and downs, pitfalls and euphoria of the market. Part 2, there is also a good short engaging parable about an old man wanting to sell his apple tree which illustrates the various methods of analyzing a company and what to consider. Part 3 highlights the achievements and mindsets of some of the great CEO’s such as Jack Welch and his endeavor to create an “integrated, diversified company”. Throughout the book the author uses such obscure and colorful metaphors that the reader is lost and confused about what the author is trying to say. The author is a law and business professor which explains the unnecessary use of his extensive vocabulary to describe simple concepts. There are also two chapters dedicated to the history of Efficient Market Theory. Buffett is able to sum this up in a couple of sentences – The market is generally efficient but it is not fully efficient. The difference between these two is night and day. A few extra sentences would make the statement even clearer but the author devotes 2 long chapters with diagrams to describe EMT. Although he does suggest that the reader skip these sections if desired, I see a professor proudly flexing his intellect and knowledge. As the book progresses towards the end, it veers towards corporate rules and intricate details about governance which lasts for pages and pages and makes for a terribly hard read especially with the language. Not a whole lot of information regarding Graham or Buffett except for a few references. The facts that the book does outline is very obvious and mainstream. Nothing to argue against there. Rather, the book should have been How To Think Like Me and Invest Like My Students. this is the worst finance book i ever read. too many difficult word and too long the preface. that books is for maths/sciences/physics geeks. come on, how many people are good at all those subjects? i prefer “the warren buffett way” better.